Liposuction is also known as “lipoplasty.” Liposuction is ideal for removing excess fat, improving contour, and improving self-image. Many people have areas of fat accumulation and no matter how much they exercise and diet, these “problem areas” do not improve. 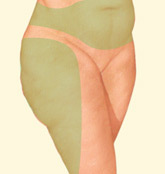 These areas of fat accumulation are ideal for liposuction. Our experienced plastic surgeon, Dr. Max Lehfeldt, is proud to offer two types of liposuction – traditional and in-office Smartlipo® laser. Liposuction can address fatty pockets: abdomen/waist, love handles, thighs, hips, buttocks, arms, neck, back, “bra roll,” chest, excess breast tissue in men, inner knee, calves, and ankles. Liposuction can either be performed on its own or in conjunction with other surgical procedures such as a facelift, tummy tuck, breast augmentation, or other breast surgery. Although liposuction can reduce fatty areas of the body, it is not meant to replace a healthy lifestyle, diet, and exercise. 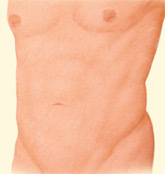 Liposuction post-op results will be long-lasting if you maintain your weight and healthy lifestyle. 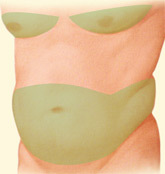 Traditional liposuction is performed in the operating room with general anesthesia. Dr. Lehfeldt also offers in-office, Smartlipo® laser liposuction that does not require general anesthesia. Some patients are candidates for either traditional liposuction or in-office, Smartlipo® laser liposuction, and it is best to discuss your options with Dr. Lehfeldt at your cosmetic consultation. 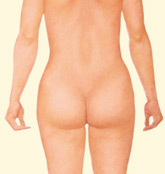 Call today 888.96.DR.MAX (888.963.7629) or email to make your appointment with Dr. Lehfeldt for liposuction! We are proud to offer our patients a revolutionary treatment that literally melts away fat with lasers while you are having liposuction. This IN-OFFICE, minimally invasive treatment is done without the added risks or costs of general anesthesia nor the added costs of the operating room and is now available with Dr. Lehfeldt! Smartlipo® is brought to you by Cynosure – the industry’s leader of laser-assisted lipolysis; Smartlipo® technology is backed by more than 10 years of clinical studies and research. A laser fiber is utilized during the procedure that directs energy to subcutaneous fat cells and destroys them. 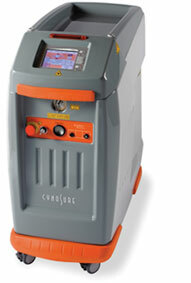 In addition, the laser energy coagulates blood vessels and results in less bruising. With less bleeding and trauma, there is faster healing! Smartlipo® utilizes three laser wavelengths that also cause tissue tightening via collagen building and collagen retraction. Smartlipo® will permanently destroy fat cells while tightening tissues for an amazing, overall improvement in your body shape. With traditional liposuction you get removal of fat, but with Smartlipo® laser liposuction, you add skin tightening! This key added benefit allows you to show off a more natural, smoother, and superior aesthetic result! 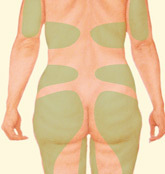 Smartlipo® is ideal for all areas of the body – face & neck (Precision Tx™) , arms, legs, and abdomen. Also ideal for the treatment of axillary sweat glands associated with hyperhidrosis (excessive sweating from the armpits). Smartlipo® is performed in our office under local anesthesia with oral medications. You are comfortable throughout the procedure and are up and around the same day! Most patients have minimal discomfort the next few days. Patients who are off all pain medications may even drive and return to normal activities about two days after their in-office procedure. Each individual is unique so activity and pain level may vary. Schedule your cosmetic consultation with Dr. Lehfeldt today! Please call 888.96.DR.MAX (888.963.7629) or email to see if in-office, Smartlipo® laser liposuction is right for you! Do you have cellulite that you try to hide? Now there is a true breakthrough in battle against cellulite – Cellulaze™. Whereas most cellulite treatments address cellulite from the outside of the body, Cellulaze™ goes below the skin and targets the “real” problem areas – fibrous tissue attachments, fat that is herniating through these fibrous bands, and thin skin. Utilizing a proprietary laser known as SideLaze3D, cellulite is precisely broken down via destruction of structural tissue fibrous bands. This laser also increases skin thickness and elasticity over a period of 6-8 months via collagen ingrowth. Cellulaze™ can be added to a Smartlipo® IN-OFFICE laser liposuction treatment (for contouring and removal of excess fatty deposits) or Cellulaze™ may be done alone. As an in-office treatment, there is no need for additional operating room nor anesthesia fees. Cellulaze™e is performed under local anesthesia with oral medications. Most patients have minimal discomfort over the next few days and can return to normal workouts and activity in just a few days. It’s time to win the cellulite war! Schedule your cosmetic consultation with Dr. Lehfeldt today! Please call 888.96.DR.MAX (888.963.7629) or email. 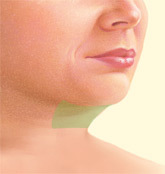 Want to dramatically improve your jawline, neck, and mid/lower face without having a facelift? Dr. Lehfeldt now offers Precision Tx™! Precision Tx™ is IN-OFFICE, Smartlipo® Laser Liposuction of the face and neck. Utilizing a proprietary laser known as SideLaze3D, the leading manufacturer of laser-assisted lipolysis is able to bring to you technology that destroys fat, tightens skin, and results in less bruising/pain and faster recovery! Precision Tx™ also treats hyperhidrosis in order to reduce excessive underarm sweat. Performed in-office with local anesthesia and oral medications, most patients have minimal discomfort over the next few days. Recovery is about 5-7 days. Schedule your cosmetic consultation with Dr. Lehfeldt today! Please call 888.96.DR.MAX (888.963.7629) or email.